We welcome you to St. Vladimir's! You will need Adobe Acrobat Reader to access the files on this page. You may download this free of charge from www.adobe.com If you have trouble accessing the files please let us know. We will be happy to email Microsoft Word copies or send you hard copies. The most concise explanation you can read to learn about the Orthodox Faith: The Indication of the Way into the Kingdom of Heaven. First written in the Aleut language, later translated into Russian, and finally into English and other modern languages. A brief overview of the Orthodox Church’s history and teachings. Information about some contemporary moral questions from the Orthodox point of view. An over view of the church building. The Orthodox Church. What the Orthodox Church believes about God: God – the Holy Trinity. 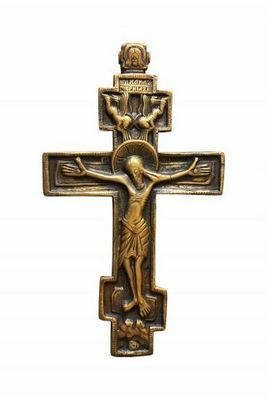 What the Orthodox Church believes about Jesus Christ: The Lord Jesus Christ – the Savior of the World. What the Orthodox Church teaches about the Mother of Jesus Christ: The Holy Virgin Mary. The Orthodox teaching about Angels. The Orthodox teaching about The End of the World. Where is the True Church? This pamphlet may help you answer that question: Finding the New Testament Church. Sola Scriptura – An excellent booklet about the Protestant doctrine of the Bible from an Orthodox perspective. Written by a former Protestant Pastor who is now an Orthodox Priest. Introduction to the Bible – The Bible from an Orthodox perspective. Very few people know that the Bible was not only written by Orthodox Christians, but also that Orthodox Christians compiled the Bible as we know it today. Prayer for the Dead – Orthodox Christians pray for both the dead and the living. Find out why by reading this pamphlet. The Orthodox Church is a sacramental Church. We do not limit ourselves strictly to The Seven Sacraments – this pamphlet will explain why. How do we pray? Why do we pray? Where do we pray? When do we pray? Prayer – the Breath of the Soul. The Saints – our Intercessors in Heaven – A very important topic in God’s Church – those who go before us and we who remain here on earth relate to them. The Divine Liturgy – Information about the most theologically significant Liturgical service of the Orthodox Church (the Eucharist). For additional web resources please see the Orthodox Christian Information Center’s “Especially for Inquirers” web site or their “Introduction to Orthodoxy” site. You may also see the web site of the Diocese of Chicago & Mid-America's "About Orthodoxy" page.